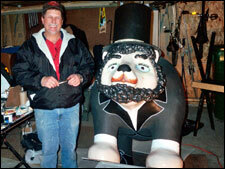 “A-bear-ham,” dave brown Associates Lincoln Bear, decorated by Dan Guest, must be studied carefully. Check out his hat band and the mark on his face, the shoelaces and fingernails. Clever. Creative. And fun. 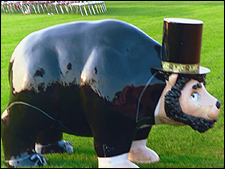 “A-bear-ham,” stands guard on the field at BASH Graduation 2005. 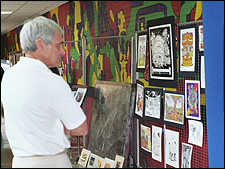 Dave Brown of dave brown Associates and sponsor of “Abe” the Lincoln Bear, checks out the art during BASH’s Arts Expo 2005. 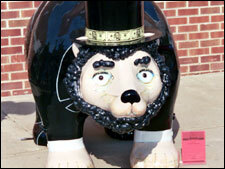 His business is located in the historic Lincoln School, which can be seen just after leaving town. I had brought my best friend and sometimes partner in crime Chelsey Kulp along to help with my first interview. David Brown is an engineer who travels all over the world, spending much of his time in exotic Thailand. 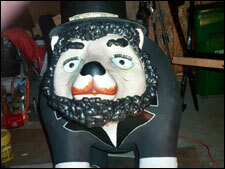 My first meeting with him did not make me think of the big business man he is, he seemed more of a down home kinda guy. But as I later learned that’s just who he is. 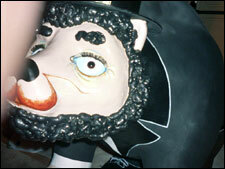 He is not stuffy or arrogant as the stereotype of big business men would lead you to believe. He is down-to-earth and somewhat humble. He answered all of our questions diligently and politely, quizzing us every once in a while to make sure we were up to par on our information about this project. What surprised me most about David was the ease in which he presented himself. With absolutely flawless charm he introduced us to his secretary who has been with him since he started his business. She also is a rather down home type of girl who has that motherly sense about her. What a perfect team the two of them make. It was on a trip to Washington, D.C. that Jane and Vickie got their first glimpse of this project. D.C. has for the past couple of years been focusing on life-sized pandas, elephants, and donkeys in their community art projects. These two women, being the creative geniuses they are, looked at each other and instantly knew that this is exactly what Boyertown needed. Therefore, you may now understand when asked why, David said he had no choice but to participate in this project. The interview concluded with a tour of the spectacular historic building that david brown Associates has made their home. The school hasn’t been changed much over the years; it still resembles the old school, complete with chalkboards. 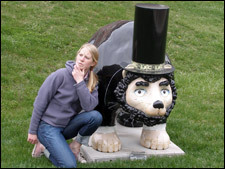 Keeping in fashion with the Lincoln theme, which is evident throughout the entire building in paintings and gifts from Mrs. Brown, it was only fitting that their bear be decorated accordingly.